Here is our second installment of Behind the Scenes of Outlander North Carolina series! We’re answering the questions: Who are we? What’s our connection to North Carolina and Outlander? Who and what makes things tick around here? What keeps us going through the Droughtlander? What are the Outlander stories of other obsessed fans? I hope you will be comforted to read how others deal with their obsession to our favorite books and TV series. Consider these interviews our way of providing group therapy for the seriously addicted Outlander fan! Today we are meeting our newest admin to our Facebook group, Tara Heller. Hi there, Tara. First, tell us a little about yourself. Hi everybody! My name is Tara and I live with my husband and 2 boys in PA near Hershey! I am a blogger over at www.ladyoutnumbered321.com. I love to write. I also love finding interesting historical facts and researching my family tree. I am interested in traveling as time and money allows. I recently took up the hobby of running and love to be outside in the sunshine! My happy place is the Outer Banks. (I have not been to Scotland yet, so technically I can’t say that is too yet.) And of course, I’m a big fan of Outlander! When did you discover Outlander? Technically January 2017, but for some odd reason, I/We didn’t get into it then. We had Starz free the end of July 2017 and that is when I got hooked! What captivates you the most about Outlander? The historical aspect, Scotland and the love between Jamie and Claire that surpasses all time and space! Have you read the books and if so, how many? Yes, 3.5 books- Voyager, Drums, Fiery Cross and now I’m smack dab in the middle of A Breath of Snow and Ashes. I know I know, I committed the cardinal Outlander sin of not reading from the beginning yet – although I saw a synopsis through Season 1 and 2, right? I do own the first two books as well, so I can read them or reference them. What has been your favorite season of the STARZ series so far? Other than The Wedding, which is everyone’s favorite, what’s your favorite episode of the three seasons? A. Malcolm, although I just love the end of Eye of the Storm because it’s action packed and ends on the shores of America and the precursor of them discovering NC! How do you feel about some of the changes that the writers have made to adapt the show from the books? I think there is some rushing through certain parts. But I feel like some elements can not be conveyed on screen, you have to read them. The book is the book and the show is the show. As long as we have Jamie and Claire’s love that’s all the matters. Who is your least favorite character and why? Um well, of course, Jack Randall because he’s so evil and strange. If you could be any character in the books, other than Claire (duh! ), who would you be? Jenny because she’s Jamie’s sister but then I wouldn’t be able to be with them in NC but I’d be in Scotland, such a tough decision! 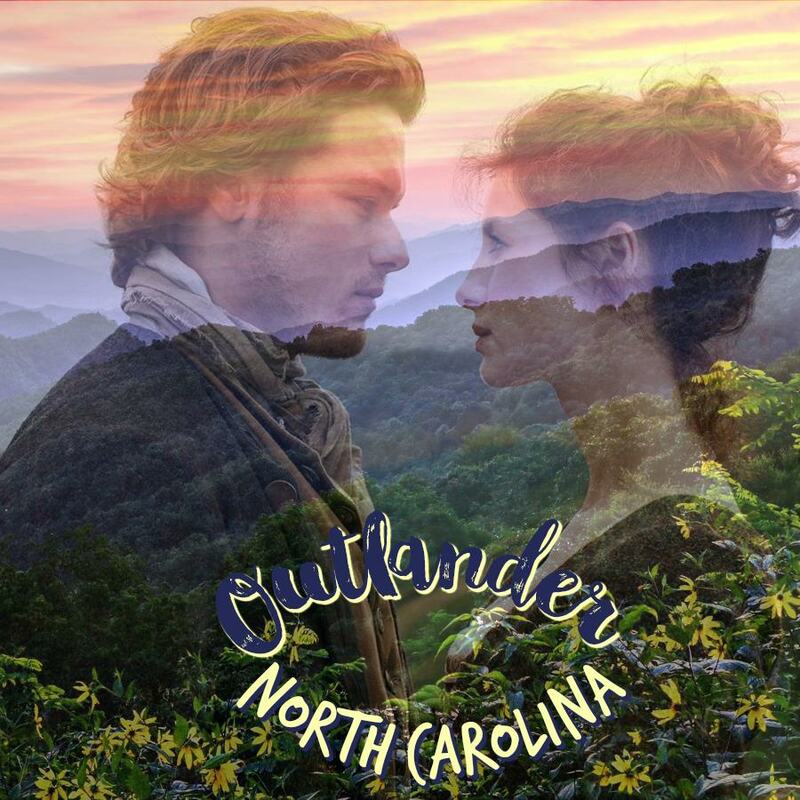 In Season 4, Jamie & Claire come to North Carolina. Yay!!! What are you most looking forward to in Season 4? Seeing the Ridge, but scene wise, a very special meeting between two very special people! Without revealing any spoilers, what passage from Drums of Autumn are you most hoping will be included in the show? The snake in the privy situation. I was reading that part on the way to Williamsburg last year and I laughed out loud and my husband looked at me like I was nuts! I immediately thought I hope I see this in Season 4! Diana’s books are full of history. Have you learned anything about North Carolina that you didn’t know before reading the books? I didn’t realize a lot of the revolution occurred in that region. Living in PA, we learn a lot more about what happened up here and down to Virginia. Have you visited any of the locations that Jamie & Claire go to in North Carolina and, if so, which ones? Not that I am aware of or know about in my reading thus far. How did you discover Outlander North Carolina? I was searching for Outlander Fan groups and might have searched North Carolina since it will be in NC this season and because I love the Outer Banks. Tell us about something about yourself that only a fellow Outlander fan could relate to. I often think how simple it would be to live back in the colonial times without technology and just having more simple living but then again things were rough too. If Claire could do it, I could – haha. I dream of running off to Scotland. During the Droughtlander, what have you been reading and/or watching to fill the void? I have been reading through A Breath of Snow and Ashes. We watched Victoria- Seasons 1&2, Poldark- Seasons 1&2. We are almost done with The Crown and TURN:Washington Spies. My husband watched TURN awhile ago and for some reason I was not into it. After I caught the Outlander fever it lit a fire for period pieces! Tara will be a contributing author for Outlander North Carolina. Among other things, she will be writing about her experience with MPC and a two-part series on herbs and their uses.